Wake Forest finished the last two home season games in an imposing manner. 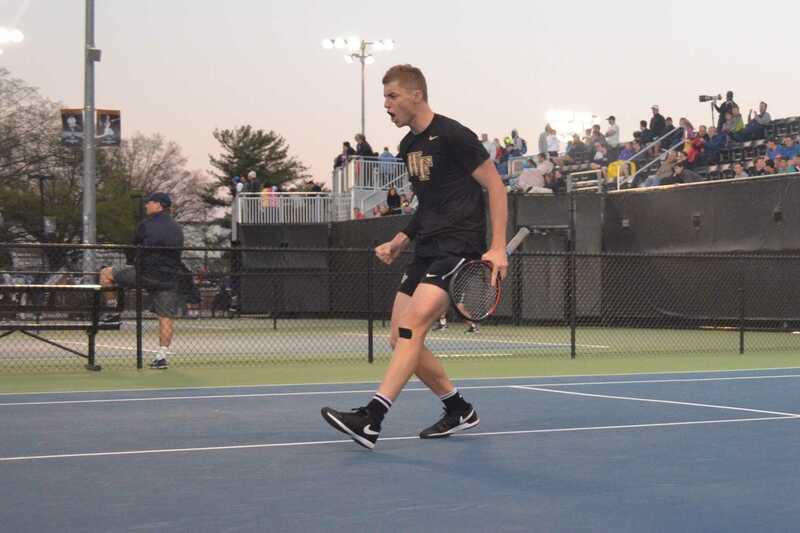 The Demon Deacons hosted Florida State University and Louisville, beating Florida 5-2 and Louisville 6-1 as they made official an undefeated home season performance this year. The Demon Deacons finished the regular season an undefeated 12-0 at home, marking the first unbeaten home season since 1980. The Demon Deacons head into the final week of the regular season with a one match lead over Virginia for the ACC regular season title. Regardless, it is safe to say that this season, the Deacs asserted themselves as a national powerhouse, ranked No. 1 nationally. Ranked third in the country, Petros Chrysochos, from Cyprus, lost a close game to No. 63 ranked Aziz Dougaz 4-6, 6-4, 6-4. Regardless, he had just returned from representing his native country in the prestigious Davis Cup where he was involved in a 4.5 hour doubles match. No. 53 in the rankings, Borna Gojo, from Croatia, put the first win on the board with an impressive showing triumphing 6-1, 4-6, 7-6 (7-5) over his opponent No. 73 Guy Iradukunda. At number four singles, Christian Seraphim, from Germany, beat his opponent with a solid 7-5, 7-5, victory over Jose Garcia. Alan Gadjiev, from Uzbekistan, and Dennis Uspensky, from the United States, also recorded wins for the team as they respectively won 6-2, 7-5, and 6-3, 7-5. Florida State, though fighting valiantly and with a rowdy fan base, never had the upper hand in the matches and also gave way to our strong squad even in doubles. The No. 1 ranked doubles team in the nation, Skander Mansouri, from Tunisia, and Christian Seraphim, beat their opponents, Dougaz and Iradukunda, 6-4. Chrysochos and Uspensky closed out the competition with a 6-3 win over Whitehurst and Whitehurst. When the going gets tough, the tough gets going. This is no cliché saying and it is perfectly applied to this situation — though strong winds modified ball trajectories and tosses during serves, the Deacons dug down deep and conquered a key win over Louisville obtaining their first undefeated home season in more than 30 years. Chrysochos beat his opponent Christopher Morin-Kougoucheff, ranked No 118 in the nation, 7-6 (7-2), 6-3. Quick on his feet, Chrysochos was always in the right place, thus forcing his adversary to run the baseline. Ranked No 15 in the nation, Skander Mansouri, from Tunisia, who also had the honor of representing his nation in the recently played Davis cup, playing at No. 2 singles, made quick work of his opponent Nicolas Rouanet, winning two straight sets 6-3, 6-4. Though forced to receive treatment between sets, Uspensky played excellent tennis coming back from a deficit to win 3-6, 6-1, 6-2. The doubles matches went in a similar fashion. The best team in the country, Mansouri and Seraphim, won 6-3 over No. 53 ranked Donohue and Wynn, while Chrysochos and Uspensky beat their opponents 6-0. The Demon Deacons will face NC State on Thursday April 20th, in the first of the three remaining road matches in the season.